Journey to the given location to find a Totem of Hircine. Travel to the indicated location on your map. Retrieve the Totem by any means necessary. Return to the Underforge, then use one of the totem receptacles to complete the quest and receive your reward. Asking Aela the Huntress, "Is there any work to be done?" will prompt her to tell you about the Totems of Hircine. She will say that she has located one and would be honored if you go with her to retrieve it. If you accept the quest, she will become your Shield-Sister and will replace your current companion. Journey to the location given by Aela and kill the enemies lurking around. The location is radiant, and it can be any animal den, vampire lair, or warlock lair with a boss chest. The totem is most often found in the boss chest. Once you have the totem, Aela will approach and ask if you have it. When you tell her you do, she will tell you to bring it back to the Underforge. When you return to the Underforge, place the totem on the marked area—the quest will finish and you will receive a leveled amount of gold. You can now pray to the totem to receive a new power while in Beast Form, which replaces your old one. There are three total totems, each granting a different ability in Beast Form. The totems are described in detail in the tome, The Totems of Hircine. By praying to these totems, you will be given a unique ability that replaces the older Howl of Terror; it is activated by pressing the shout button while in beast form. All abilities last for 60 seconds, though the duration can be increased by 15 seconds by equipping the Ring of the MoonDB before activating Beast Mode. You can only trigger this quest if you are still a werewolf. If you have purified yourself, you are unable to do this quest. If Whiterun is under attack, you cannot enter the Underforge until Whiterun is back to normal. It will tell you a key is needed to enter and that it cannot be lockpicked. At the end of this quest, Aela will begin praying to the new totem in the Underforge. It is possible to ask her to follow you while she is praying; her dialogue will change, and she will allow you access to her inventory, but will not stop praying or move away from the totem. Aela will not give these quests while she is an active follower, though she will give Animal Extermination quests. If you have just dropped off a totem in the Underforge, Aela will be praying to it and only offer an Animal Extermination quest (dialogue option, "I'm looking for work"). Leave the Underforge, return, then talk to Aela again. Repeat until Aela (still in prayer) offers the next totem quest (dialogue, "Is there any work to be done?"). 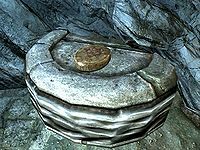 If you've completed A Daedra's Best Friend, you may be taken to Haemar's Cavern and your system can lock up when entering Haemar's Shame. You won't be able to complete the quest and will have Aela as a follower, but with no dialogue options. This also seems to happen if the totem is located in Morvunskar, and A Night To Remember has been completed. This can be worked around by carefully navigating around the point where the portal to the Misty Grove was placed earlier. ? This can be resolved by manually advancing the quest with the console command setstage cr12 20. Curing yourself of lycanthropy before taking this quest causes the Underforge door to become unresponsive. You cannot end the quest or get rid of Aela as a result. You can finish the quest using the console command coc "WhiterunUnderForge" and placing the totem in its place, but Aela may stay inside, forcing you to use the command each time. ? While recovering a totem located in Ansilvund, it is possible that one of the swinging axe traps may knock Aela through a hole in the map, rendering the quest un-fulfillable. Aela may reappear at a later time although the trigger is unknown. Common factors such as fast traveling and waiting are worth trying. ? One method that has been found effective is to pray at one of the previously acquired totems. Aela may then appear at the entrance of the Underforge. If Aela won't give you the first totem quest, check the status of this quest with the console command "sqs cr12". If both Stage 0 and Stage 1 are marked as completed (with a 1 behind the respective stage), use the console command "resetquest cr12". It is recommended to do this after handing in an Animal Extermination quest but before asking for more work. ? If you do not complete all of the radiant quests of Aela the Huntress in the initial wave before advancing, you will be stuck doing Animal Extermination quests from her indefinitely, unable to collect the Totems of Hircine. ? If Aela is chosen as your wife, after completing a totem quest she will stay and pray at the totem and will not return home. This can be fixed on Xbox 360: You need lots of healing and dual-casting master illusionist abilities. Have her as a follower, take away all her weapons and give her a cheap sword. Then punch her enough times to get her to attack you (heal yourself as needed). Go through the front exit so you are outside of Jorrvaskr... she should follow you out and continue to attack you. Lead her off a good ways at which point, Dual-cast Calm on her and immediately talk to her and have her re-join you. Test her compliance by drawing a weapon or spell (she should do likewise, not just stand there - if she doesn't draw, restart the process). Once she's drawn a weapon, fast-travel to another location. She should now act normally, and if a spouse or steward, should remain at other locations when dismissed. 10 Aela has tracked one of the Totems of Hircine to <Alias=Dungeon>, and has come with me to retrieve it. 20 Aela and I retrieved a Totem of Hircine from <Alias=Dungeon>. On the PC, it is possible to use the console to advance through the quest by entering setstage CR12 stage, where stage is the number of the stage you wish to complete. It is not possible to un-complete (i.e. go back) quest stages, but it is possible to clear all stages of the quest using resetquest CR12.